In Europe, large carp are often referred to as “the queens of the rivers.” In the U.S., imported carp queens from Europe are also at home in river currents. Introduced in the early 1900s, they quickly thrived and reproduced in large river systems. In the Northeast, large carp weighing over 20 pounds are abundant in larger river systems. In fact, a fisherman’s best chance at landing a big carp is to fish in a river. The bigger the river, the better the chance of catching a trophy carp. This 31-pound, 8-ounce mirror carp was landed by the author in the Blackstone River in Rhode Island. It is the largest known mirror carp ever landed in Rhode Island. New England’s large river systems rival any in the U.S. for large carp. The Connecticut River, which flows through Vermont, New Hampshire, Massachusetts, and Connecticut, is the jewel of New England when it comes to river carp fishing. More 20-, 30-, and even 40-pound fish are landed every year from this system than from any other river in New England. 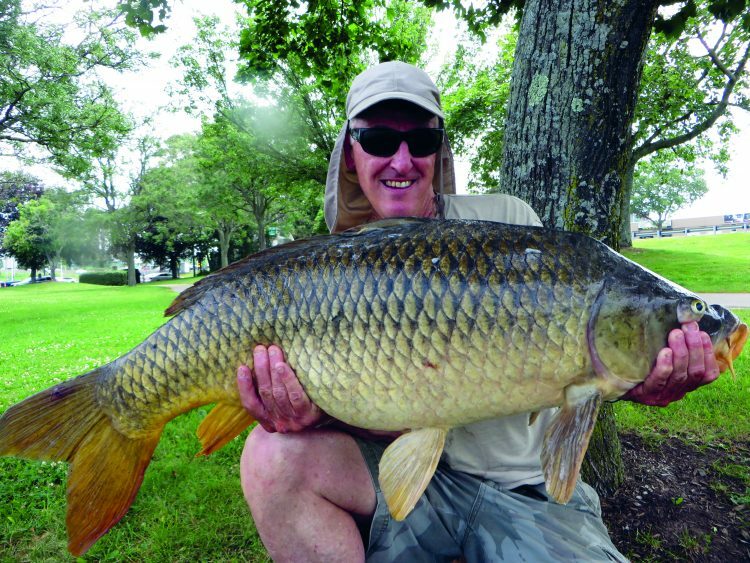 In Massachusetts and New Hampshire, the mighty Merrimack River also serves up loads of big carp. In little Rhode Island, the Blackstone River offers a unique abundance of mirror carp. (These are carp with random scales or large and small scales in patterns as unique to that individual carp as a fingerprint is to a human.) Many think the Blackstone is the best mirror carp river in the entire U.S., since large mirror carp weighing more than 30 pounds have been landed from its banks. There are many other carp rivers in New England, including the Charles, Housatonic, Thames, Assabet, Taunton and Ten Mile, to name a few. Fishing a river for carp is far different from fishing a lake or pond. The main difference is that you must deal with current, which puts a whole different demand on equipment and rigging. Many would also argue that you are dealing with a much stronger and tougher fish that has lived in swiftly moving water. A couple of outfits sit on a rod pod waiting for a hit along the Merrimack River. Note the bait-feeder reels, probably the most important piece of equipment for carp fishing. River carping is not a light-tackle game. You can’t hunt 30-pound carp with a freshwater bass fishing outfit. The experts use 12-foot specialized carp rods that cast big sinkers packed with bait. 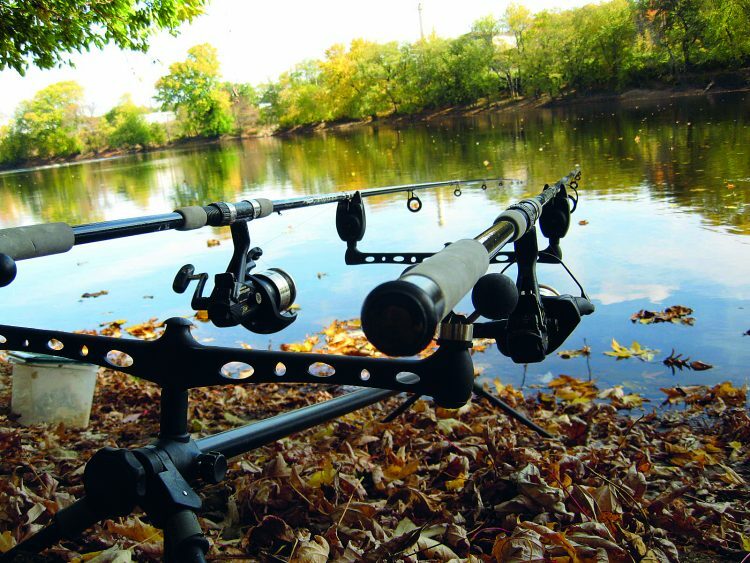 These rods can also put the brakes on large carp bolting downriver. Most match these long rods with large bait-feeder reels since carp often hit without warning and scream off on the initial take. The bait-feeder reel allows line to be taken out while the bail is closed, then once the reel’s handle is turned, the drag is engaged. I’ve seen outfits with traditional spinning reels pulled into the water in the blink of an eye. Large bait-feeder reels like the Okuma Avenger ABF 55B and ABF 65B, along with the Shimano BTR6000D or BTR8000D, are what most serious anglers use for carp. As for lines, most prefer either 20-pound-test monofilament (I like Berkley Big Game) or 30- to 50-pound-test braided line. I use mono because of its stretch, soft feel, and abrasion resistance, though fishermen who prefer braid point out the strength of the line as well as its long-casting ability. From my own observations about line, it’s nearly an even split among experienced carp fishermen. An assortment of carp sinkers, which allow the line to slip through the sinker of the take. 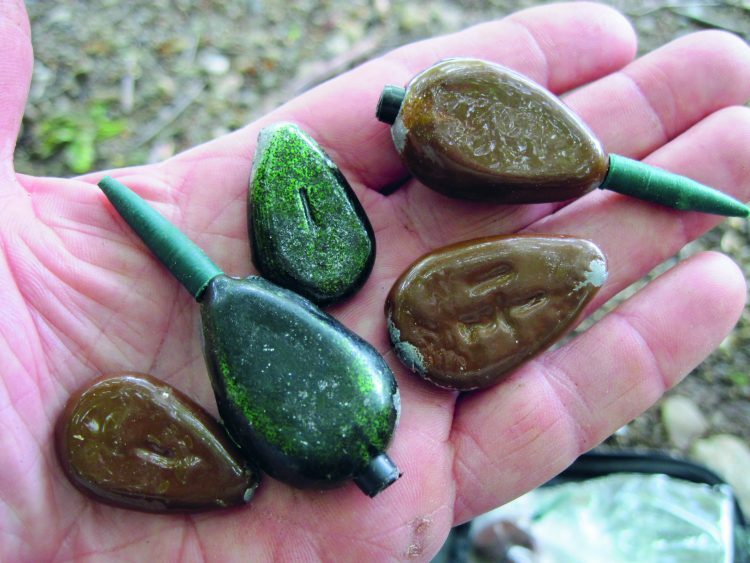 Carp fishermen who want to go light on hardware prefer these types of sinkers. Note that they are painted to blend in with the bottom. There are many fishermen who use their saltwater striper gear to fish for carp in rivers. That gear will work with some modifications. The most important aspect to using a “regular” spinning reel is to turn the drag to its lowest setting that will hold bottom in a current. When a fish hits, you can grab the rod and slowly tighten the drag as the fish tears down the river. It’s not ideal, but it is one way to fish with a non-baitfeeder reel. The sinker is a key component to rigging for river carp because it must be large enough to hold bottom in the current. 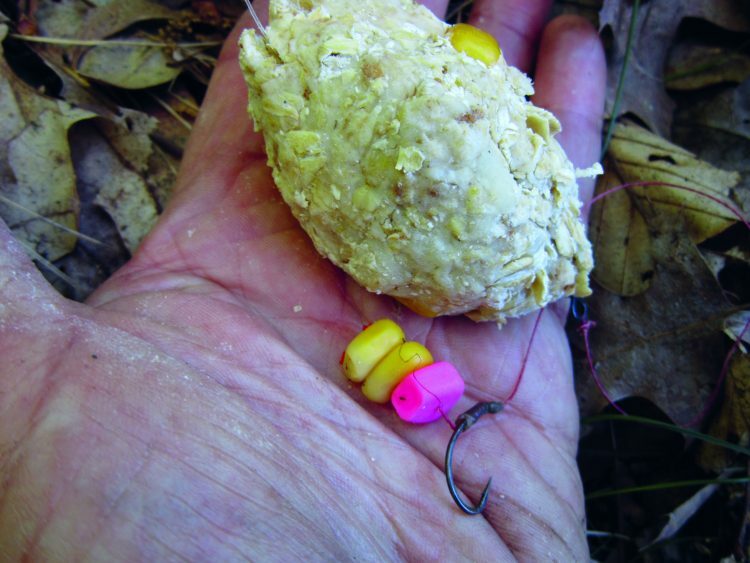 The key is to go with the smallest sinker that will hold – in most cases, 2- to 4-ounce sinkers will suffice.However, a sinker as small as 1 ounce might work in slow-moving currents so river carp fisherman should carry several different sizes. A method ball is packed around the sinker. As this rests on the bottom, the chum dissipates, forming a ring of bait around your hook bait. I find that if I need to go with a sinker larger than 4 ounces, the river is probably not fishable. High and fast-moving river flows that bring down debris and weed will move any size sinker and are often unfishable. The USGS Stream Flow Data website monitors the current and height of most rivers and streams in southern New England. 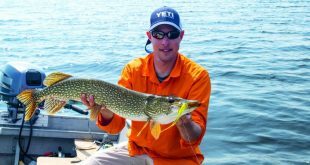 This information can be valuable to fishermen who intend to travel long distances to fish since it provides a snapshot of what the river currents are like. Generally, if the flow is far above the long-term median flow for that day, the river is not fishable. I use this information often, and have learned from experience which flows are fishable, and which are not. Combo baits, such as this white plastic pop-up corn along with two kernels of real corn, are a killer bait for carp fishing. This rare fantail common carp was landed in the Connecticut River in Connecticut. It hit a combo bait of artificial and real corn. There are many advantages to using a hair rig when river fishing for carp. It provides superior hook-ups since the exposed hook grabs the carp in the lip on the take. In fact, I have never guthooked a carp when using a hair rig. In addition, you can use hard combo baits on a hair rig, something that can’t be done when putting the bait directly on the hook. thedoughball or a small 10 mm boilie (a prepared carp bait) along with a plastic corn kernel. I also vary my colors with the artificial corn. Warm colors, such as white, orange, pink, and yellow, can be top producers. The strategy when fishing big rivers is to go with different combo baits on my two or three outfits (where allowed) and to find the best producer. Last year, while fishing the Connecticut River, I landed back-to-back 30-pound carp using a combo bait consisting of two kernels of maize (large whole corn) along with one pink artificial corn. 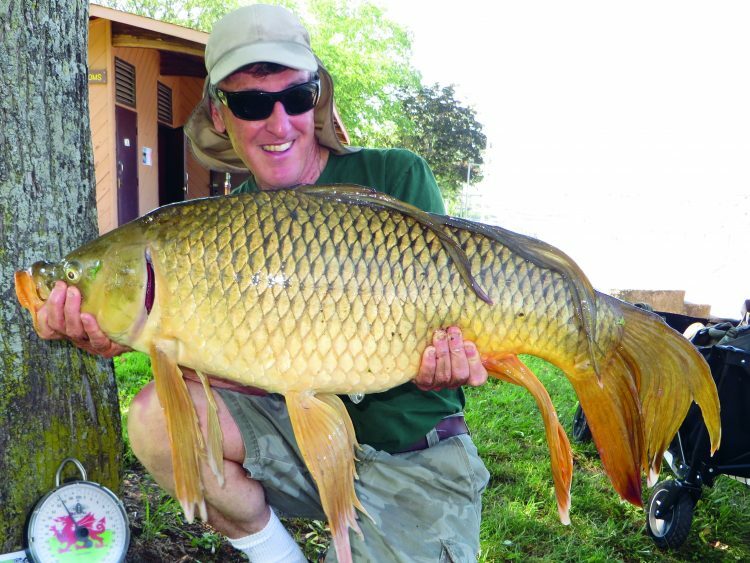 Chumming beforehand is an important aspect of carp fishing because it tends to bring feeding fish into the area and increases the chance of success. Ideally, chum the day before or the evening before fishing, though I know it is not possible when traveling long distances to fish. If I can’t chum beforehand, I usually toss in many spoonfuls (using a throw spoon) of bait. If I start catching fish, I continue baiting with maize to keep fish in my spot. This huge river carp weighed in at 34 pounds. Carp over 30 pounds are considered trophies in New England. I buy maize, or whole corn, at a feed store, then boil this up for half an hour to soften it before use. 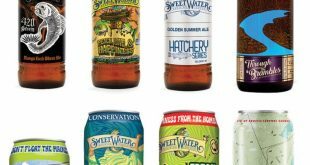 However, some states have regulations regarding chumming and the use of corn in trout-stocked waters. Check state regulations before chumming. Another trick that most river carpers use is called a method ball. This is a bait ball consisting of old-fashioned oatmeal and bread mashed together. Water is then added to get the consistency of a snowball and it is packed around a sinker. Once this hits the bottom, it begins to dissipate, leaving a circle of chum around the hook bait. Most serious carpers use either method balls or PVA bags (bags that melt away) filled with chum to enhance their presentation. These can make a big difference in the catch rate. 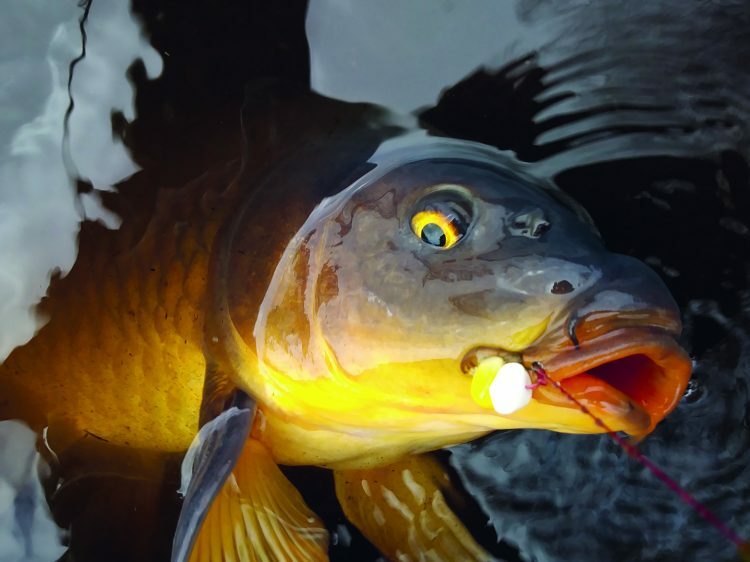 While the big river systems hold some massive carp, they also hold their share of surprises since many species of fish take bait intended for carp. Last year on the Connecticut River, I got the shock of my fishing life when a sturgeon took my combo bait. It was the only one I had ever seen up close. I also landed a rare fantail common carp, a fish with very long, flowing fins and tail. Along the Blackstone River, I caught a good-sized pike last year that inhaled my plastic corn and chickpea combo bait. I have also landed many large channel and white catfish while fishing for carp in these big rivers. So, be prepared for just about anything when that lines zips off. Many fishermen who tackle New England’s large rivers are overwhelmed about where to start. I prefer to fish deeper, slower-moving waters in these rivers. Large carp will not fight fast currents and are often content to hang in the easy, slow flows, which are normally the deeper spots. When fishing an unfamiliar spot, I generally fish one outfit far out and one in close – the close one is cast to my chum area. The rods are mounted onto bite alarms, which work well if the rods are spaced a distance apart. 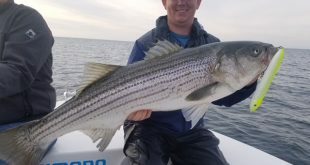 In most states you can fish two rods, though Connecticut allows three. As for specific spots, I check a map of any river I intend to fish and look for state or city parks, since these often offer easy access as well as parking. There might even be other carp fishermen there who will share their knowledge. One other suggestion is to join a carp-fishing club such as the Carp Anglers Group (carpanglersgroup.com ). This club has a network of knowledgeable carp fishermen in every state, and they also run tournaments and events. If you are looking for a monster carp, early summer through fall is a great time to catch one in a large New England river system. River flows are usually manageable at these times, and carp are active and feeding in the warm summer months. They can be caught both in the daytime and at night. 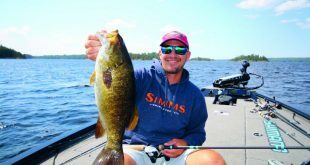 Be prepared for what could be the biggest challenge of freshwater fishing in these parts, as fish in the 20-, 30- and even 40-pound range are a real possibility!